Benjamin Netanyahu has released yet another campaign video which has stirred Israel. The footage presents his Likud party as the only safe pair of hands against terrorism, claiming the left-wing opposition will let Islamic State militants into the nation. Islamic State (IS, formerly ISIS/ISIL) militants are advancing in Syria and Iraq, prompting not only international efforts to stop them, but also spreading fear through media with countless reports on executions of homosexuals, as well as those who smoke or use mobile phones. In a controversial move, Netanyahu’s Likud party has decided to capitalize on those fears ahead of the Knesset elections set for March 17. The prime minister’s official Facebook page posted a video showing actors dressed up as ISIS fighters, driving a pick-up truck through a desert. Words emblazoned on their flags read “Us or them, ISIS version” in Arabic. The truck itself has a bumper sticker reading: “Just not Bibi,” also in Arabic. The fake militants pull up next to another driver and ask “How do we get to Jerusalem, bro?” in Hebrew, with a heavy Arabic accent. “Take a left [turn],” the other driver says. 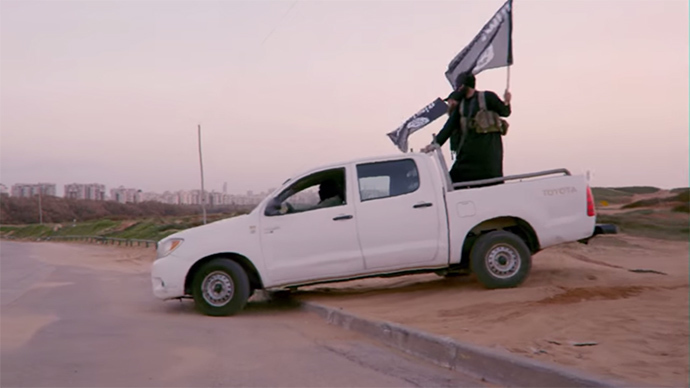 A tacky ISIS-like title card then appears on the screen, which reads: “The left will give in to terror,” in an apparent reference to the left-wing Israeli opposition led by Tzipi Livni. The video post came with a caption reading: “This time choose Likud headed by Netanyahu or a weak submissive leftist government with Tzipi.” Over 15,000 people have so far ‘liked’ the post. The campaign footage has stung the Zionist Camp, an alliance which represents parties to the left and center of Israeli politics and has accused Netanyahu of living in a fantasy world. “Netanyahu lives in a fantasy if he thinks we’ve forgotten his colossal failure in the area of security. He released more than 1,000 prisoners with blood on their hands, strengthened Hamas, Iran became a nuclear threshold state on his watch and the personal security of Israelis is compromised daily,” the Zionist Camp said in response to the video, as quoted by i24 News. Yuval Diskin, the former head of the Shin Bet security service, said that Netanyahu is presiding over a huge list of policy failures and has “lost all shame” by making such claims. “The man who released terrorists so as not to freeze settlements in a deal with Habayit Hayehudi, the man who was dragged into the longest war since the War of Independence against a terror organization, the man who threatened Iran and cannot subdue a terror organization in Gaza. He has lost shame, that’s for sure,” he said. The latest video in Netanyahu’s election campaign is perhaps less unnerving than a previous one, where he appears unannounced at one couple’s house and announces that he is their babysitter – or as he put it, the “Bibi-sitter” – and the only man in Israel who can look after the nation’s children.